"You’re a Consultation Away from the Grant You Need!" Save Time and Frustration by Getting the Answers NOW! If you’re looking for a government grant, then you’ve came to the right place. Grant Solutions is a one-stop-shop when it comes to understanding government grants. Been featured in numerous Australian and international publications. Been invited to appear on national television and have spoken at conferences. 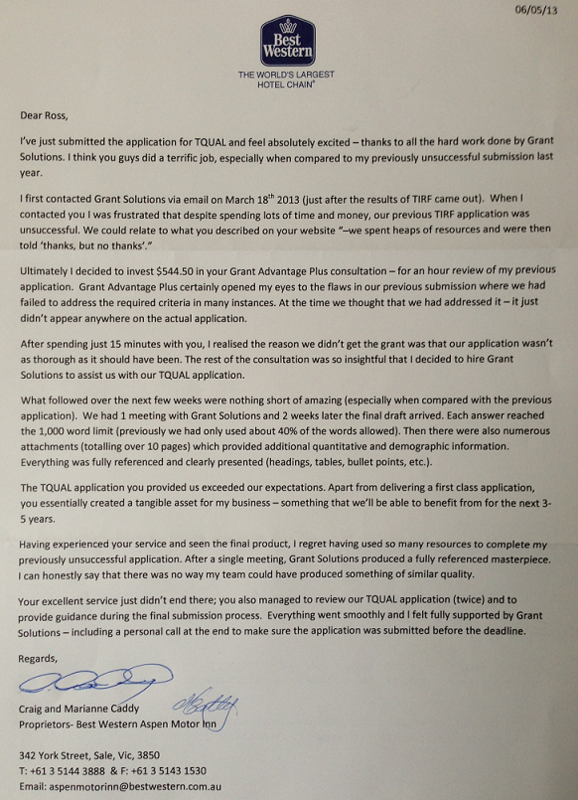 You’ve probably already heard of Grant Solutions and are now looking for specific advice regarding your project. That’s the best way to get the answers you need from experts who work with government grants every single day. Each day Grant Solutions recieves phone calls and emails (across all industries) from people keen to get a government grant. We are often overwhelmed by the scale of these inquires. While we’re happy to be recognized as the ‘go-to-experts’ for government grants, the sheer volume of inquiries make it difficult to spend adequate time with each person individually. Over the years, we’ve also noticed that a large proportion of these inquiries come from people new to government grants and seeking very basic information. “What does Grant Solutions do”? Most of these questions (and others of similar nature) can be answered by doing a simple Google search. Yet, in order to provide specific information about your business, we need to spend 30+ minutes analyzing your situation in detail. Recently we’ve helped 20+ clients obtain between $300,000 and $500,000 (each) for their project – in a single round! In fact, almost every client that we’ve worked with for that program was suceessfull in getting a grant. This was only possible because we screened all inquiries and only dealt with those who were serious. Sure, this inconvenienced some – but it delivered an outstanding result to our clients. Ultimately talking to people who are not serious takes away time from those who are. As our fees are primarily Success based, we only want to work with people who are committed. As a result, we have developed the Grant Advantage PlusTM – an in-depth consultation with a government grants-expert. Summarise the session and key takeaways. The first 2 items is when we do the most talking – sharing what we’ve learned over the last 8 years. That’s where we reveal our secret grant strategies first before discussing your project to set the scene. For example Secret #1 is that grants should be approached with a ‘give’ rather than ‘take’ mentality. The focus should be not on what the grant will do for you – rather it should be on what your project will do for the government and the community around you. Ultimately you will only get what you want (grant funding) if you can show the government how they can get what they want. This may sound trivial to you – but makes a big difference during the assessment process. Then it’s your opportunity to tell us about your project and how we can assist you with obtaining funding. The whole process has been specifically structured for you to get the most out of the consultation. It’s like spending 1 week finding this information for yourself – except that it all happens within 60 – 75 minutes. Due to our success in winning government grants, there has been a significant increase in the number of people interested in using our service. Many of our happy clients refer their friends and colleagues. In addition, there is also a natural growth over the last 8 years (not to mention all the media exposure we’ve received – The Age, SMH, Financial Review, SmartCompany etc.). While things were quiet in 2007 when Grant Solutions first started, there is now a long line of business owners looking to benefit from our skills. Success is a double edged sword as we’ve received calls from as early as 7am to as late as 9pm (including weekends and public holidays). It’s especially frustrating when concentrating on a grant application only to be interrupted by a call from someone wanting a casual chat about grants. When things get really busy, we often remove our contact details from the Grant Solutions website – so only existing clients are able to contact us. Investing in a Grant Advantage PlusTM consultation enables you to “jump the queue” and talk to a consultant within a few days. Your investment into to the Grant Advantage PlusTM consultation demonstrates to us that you’re serious and the type of person we want to work with. Many business owners apply for government grants – only to be rejected because they haven’t met the eligibility criteria. Unfortunately, the government is of limited assistance in this area because you’re always dependent on who’s on the other end of the phone. We’ve spoken with customer service representatives who got tired of listening to questions (the answers to which they didn’t know) and just told us to ‘give it a go’ and ‘put in an application’. They probably wanted to get us off the phone so they can keep their efficiency rate high. Have a good chance of being successful. At the end of the consultation, you will be able to make the “go – no go” decision. If we don’t believe you project meets the eligibility criteria or is unlikely to be successful, we will tell you. We’ve turned away many clients who wanted to pays us thousands of dollars because we didn't believe that it was in their best interest to submit an application. This means that after the Grant Advantage PlusTM consultation you’ll know exactly where you stand and whether we’re willing to accept you as a client. Business owners are often keen to get something for ‘free’ until they realise that ‘free’ does not really exist – there is always a cost, even though it may not be initially apparent. For example, government departments routinely offer ‘free information’ by staffing their hotlines with often poorly trained customer service representatives. Many of them have limited understanding of the program (as they may look after 15 different programs simultaneously). They generally don’t feel comfortable answering questions (other than the 10 questions that they have pre-written answers to). If you’re asking a specific question (e.g. you’ve actually read the grant guidelines and want to see how they apply to your project), you’ll probably be directed to “send the question in an email format to a particular address … so someone, from somewhere, at some point in time will get back to you with something”! Even if a customer service representative does offer you specific advice – is it in your best interest to take it? Apart from being on the other side of the phone, what makes them qualified to give that advice? Where is the source of this advice? Do they actually know or are they’re just guessing? Do they have relevant degrees / industry qualifications? Have they successfully applied for similar grants previously? Have they even read the guidelines 10+ times to get a deep understanding? If the answer to these questions is ‘not really’, then what sort of ‘free advice’ are you getting? At Grant Solutions, the answer to all those questions is a resounding YES. The company was specifically created to help Australian businesses just like yours win government grants and has the skills, industry insight and experience to give you quality advice for your project. For example, our Managing Director has 3 advanced degrees from Melbourne University and a number of industry certifications. It’s a completely different experience speaking with him compared to speaking with someone who is ‘temping for the day’ and answering the phone with a sheet of FAQs in front of them. So if you’re looking for quality specialised advice which is based upon success, then the Grant Advantage PlusTM consultation is for you. Grant Advantage PlusTM consultation enables us to spend 60-75 uninterrupted minutes focusing on your project. This was all done to fully understand what the government is looking for. After working with so many clients from diverse industries, we have a unique understanding of how the government thinks and what they are likely to fund. This includes what is officially published in the grant ‘guidelines’ and also what really happens when grants are assessed. Some of the ‘hidden insights’ come from reading Auditor General reports – a separate department within the Commonwealth which audits government funding programs to ensure transparency and good decision making. These reports often criticise the department for not following Commonwealth Grant Guidelines. During the Grant Advantage PlusTM consultation, we will analyse your business and match grant opportunities for you. If you already have a specific grant in mind, Grant Advantage PlusTM consultation is an opportunity to get your specific questions answered and therefore increase the probability of your success. We are committed to clients getting value from the Grant Advantage PlusTM consultation. That’s why the consultation offers a 100% satisfaction guarantee. In all the years we’ve offered it, we’ve only had 1 client who requested their money back because it wasn’t right for them. Please note that the money back guarantee applies only during the first 20 minutes – which should be more than enough time to confirm that you’ve made the right decision. The other good news is that the consultation is fully credited towards your account for future grant services with us, so it’s essentially free. If you’ve recently discovered grants and just looking for “entry-level” information, our website makes it available for free. However, if you want to speak 1-on-1 with a grant expert about your specific project then the Grant Advantage PlusTM consultation is the best option available to you. At this stage, you will appreciate our expert advice, understand it and fully benefit from it. To request the Grant Advantage PlusTM consultation, please see the Enrolment Form now.